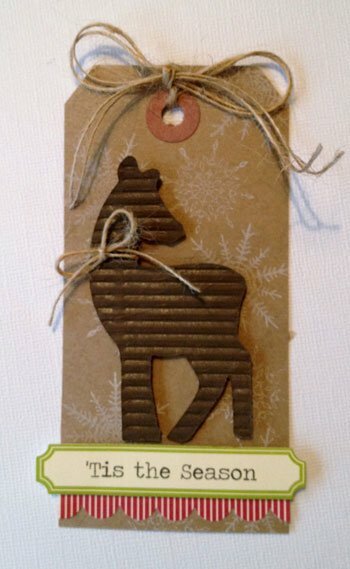 “Here is another cute and quick tag for that last minute holiday gift! In fact, set aside an hour and make a whole bunch of tags to have on hand! Stamp the background with white ink. Cut a piece of pattern paper to fit the tag width and scallop punch one edge. Adhere to the tag. Die cut the deer from brown corrugated paper. Adhere to the tag with foam adhesive. Add the sentiment sticker to the tag with foam adhesive. Tie twine into a bow around the die cut and in the top of the tag.